My daughter will be starting kindergarten this September, and I’ve been thinking of ways to get her ready for this huge milestone. One thing I’d really like to help her with is spelling her name. Even if she can’t write it out herself, I want to get her familiar with the spelling and letter-sounds involved. It’s a great way to get kids feeling responsible for their classwork, identifying their belongings and is a nice transition towards writing. 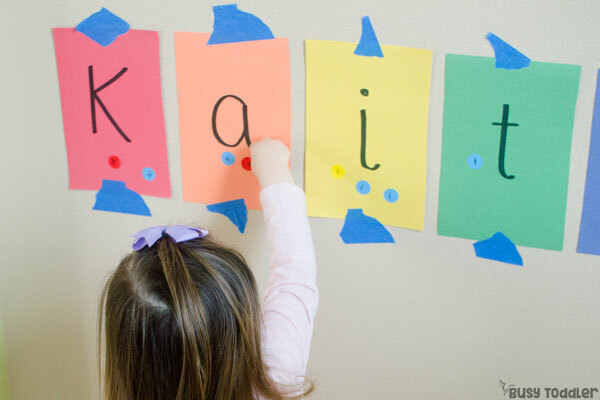 Here are my 5 favorite name spelling practice ideas! My daughter is a bit obsessed with playdoh and finds any excuse to use it. I have a hunch that most kids would jump at a chance to use playdoh actually! I love that this activity gets some writing practice in using some unique tools. 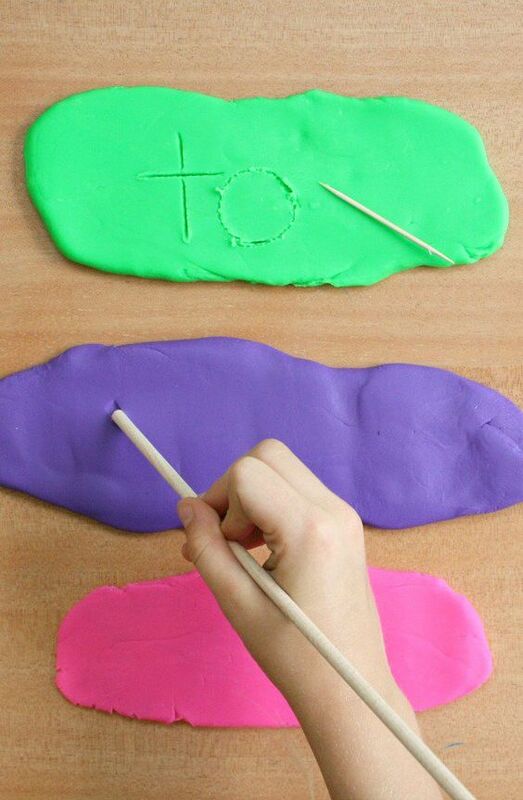 You could also have your kids write their name in clay as some art for their room or as a keepsake for yourself :). 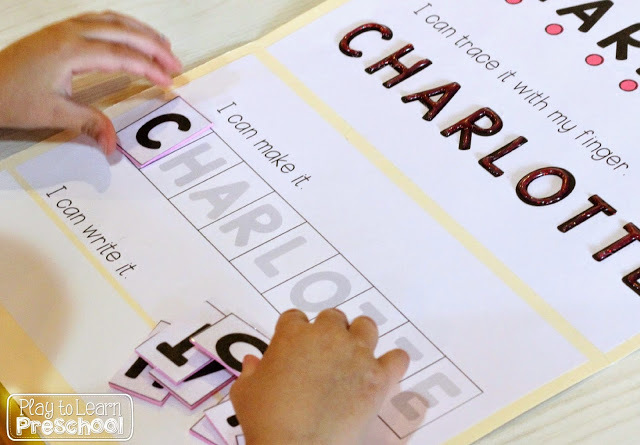 Another awesome way to practice spelling their name is by using this awesome printable name folder. There are plenty of different activities to keep kids interested. 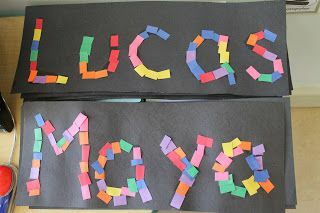 My favorite activity from this set is the one pictured above, where kids have to place letter tiles in sequence in order to spell out their name. Find the name folder here. This is by far my favorite spelling activity. Even though the kids don’t actually write their names they do become more familiar with the sequence of letters and sound recognition. It’s perfect because the kids wont be focusing on writing their letters accurately. My daughter loves to peel and place stickers, so I know this will be a hit in my house. I get all the feels when educators get creative like this! 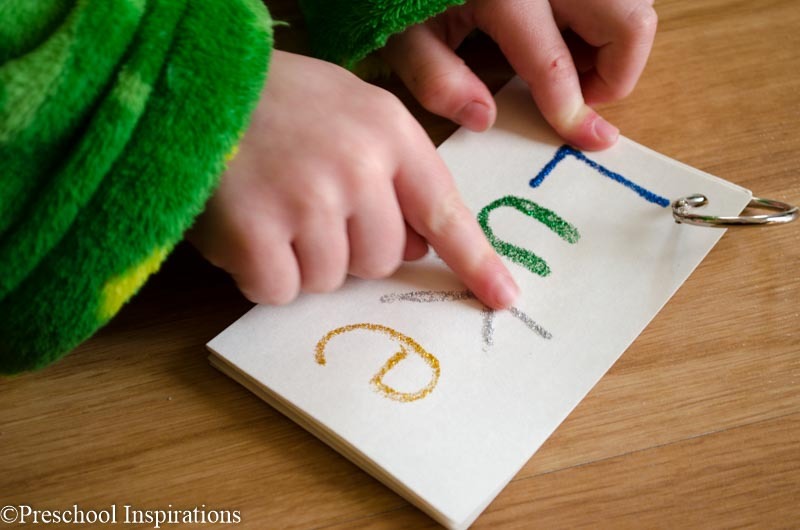 Check out this tactile name activity by Preschool Inspirations. It has kids using their fingers to trace along letters, which is meant to get kids familiar with the lines and shapes associated with each letter. This is a definite must-try for us! Practicing their names is definitely one important element of this name art, but what I love is the pride associated with displaying children’s names this way. My daughter beams when we decorate her name and display it somewhere. It makes her feel special and valued, and I think it may even go towards boosting her confidence. It’s also great to display this type of art on the wall as a constant visual reminder of the letters associated with their names. What’s your favorite name spelling practice?